1. Click on the Settings icon, which you will find on the top right corner of the screen, and choose BILLING Settings. 2. You will now see the Basic Settings screen. 3. If you would like to have the bill be numbered automatically, please turn the feature in the Basic Settings on. You will then see the possibility of creating a numbering format as well as deciding, what the next bill number should be. 1. 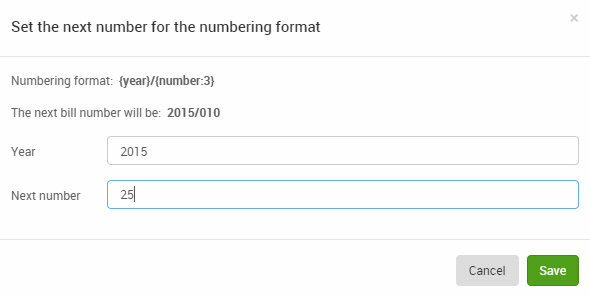 Next to the numbering format, you will see the default numbering scheme used by BILLING. If you'd like to change the default format, please click on the button "Change format". 1. Here you can set any format you would like, using the various format element. Please note, the bill number must always be part of the numbering format. 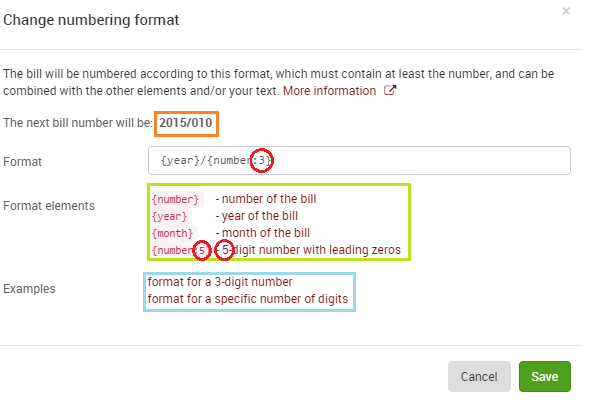 At first, you will see the default numbering format for BILLING. 2. Once you change the format, the number will start back at "1". You can always change this in the next section. 3. Please check the box that you agree to this and click "Save". The format change will be applied. 2. Here you can enter what the next number will be. Please note, that this is according to the numbering format chosen above. 3. Please click "Save" to apply this change.